Big bands dead? Far from it, my friend. In fact, so many spectacular new albums have been released this year that I may have to enlarge my Top Ten list to a Top Twenty. 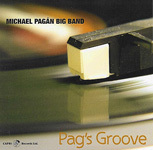 Here's another leading candidate for inclusion on anyone's honor roll, Pag's Groove, composer/arranger/pianist Michael Pagán's highly impressive big band debut on Capri Records, which continues on an upward curve set in motion last year with a trio of superb recordings by the Mark Masters Jazz Ensemble. 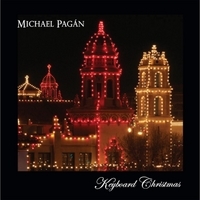 While Pagán's ensemble is first class, what impresses most are his spellbinding melodies and challenging yet charismatic charts, which abound with tantalizing twists and turns and brighten a number of genres from blues to bossa, burner to ballad. 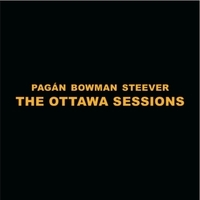 Pagán arranged every number and wrote all but the sensuous Jay Livingston/Ray Evans ballad "Never Let Me Go, to which he and tenor saxophonist Tom Myer append ardent solos. The album opens on a swinging note with the upbeat "Essential Trivia, whose deft harmonic structure is the polar opposite of lightweight. 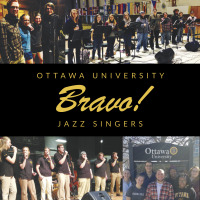 Sprinkled in are sharp improvisations by Pagán, baritone Clare Church, and Al Hood, the first of five standout trumpet soloists. 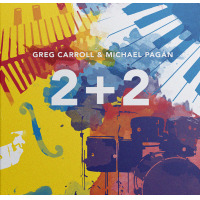 The second is Greg Gisbert, who is showcased (on flugel) on the softly swaying bossa "Lyric Interlude, which precedes the title selection, a saucy twelve-bar blues that pays homage to the late vibraphonist Milt "Bags Jackson. Cogent statements by trombonist John Hines, trumpeter Garner Pruitt, and vibraphonist Greg Harris, who sits in for Bags on three lucid choruses, are interspersed among captivating passages by brass and reeds and a lively coda that briefly merges the Pagán and Jackson themes. The multifaceted "Waltz for a Bad Hair Day features Myer on soprano sax and Pete Olstad on flugel with strong and tasteful drumming by Dave Rohlf, who is superb on every number, as is bassist Bijoux Barbarosa. "Crazy Man's Game, written for Pagán's mentor at Northwestern University, Don Owens, is a swinging example of "twelve-tone serial writing, which may seem esoteric but sounds quite candid, as do the solos by tenor Eric McGregor and alto Kurtis Adams. Brad Goode's plaintive trumpet introduces the ballad "More Than a Friend, on which he is featured (open and muted) with Tom Ball on euphonium. The invigorating finale, "We're Almost There, is a graphic tour de force in 7/4 with frequent chromatic changes, strong rhythmic counterpoint, an electrifying sax soli, credible comments by trombonist Darren Kramer, alto Pete Lewis and guitarist Bill Kopper, and a delightfully surprising fade at the end. 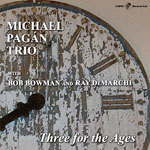 During his student days, Pagán (who earned a doctorate in composition from Northwestern) was recognized by DownBeat magazine as a "Musician Deserving Wider Recognition. That's no less true today than it was then, in fact even more so. His formidable ensemble also warrants broad approval for its indispensable role in transforming Pagán's bright and creative manuscripts into one of the year's most persuasive big band albums. Track Listing: Essential Trivia; Lyric Interlude; Pag's Groove; Waltz for a Bad Hair Day; Never Let Me Go; Crazy Man's Game; More than a Friend; We're Almost There. 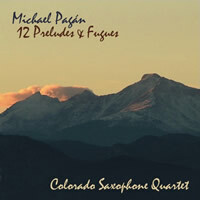 Personnel: Michael Pagan: leader, piano; Pete Olstad, Brad Goode, Garner Pruitt, Al Hood, Greg Gisbert: trumpet; Pete Lewis: alto and soprano saxophones, flute; Kurtis Adams: alto saxophone, flute; Tom Myer: tenor, soprano saxophone; Eric McGregor: tenor saxophone; Clare Church: baritone saxophone; Darren Kramer, John Hines, Kevin Buchanan: trombone (1-3, 6-8); Tom Ball: trombone (4, 5), euphonium (2, 7); Matt Plummer: bass trombone; Bill Kopper: guitar (2, 4-8); Greg Harris: vibraphone (1, 3); Bijoux Barbarosa: bass; Dave Rohlf: drums.